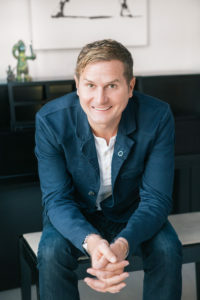 Our guest today Rob Bell is an author, motivational speaker and former pastor. Time Magazine named him one of 100 most influential people in the world. He toured with Oprah as a speaker on her “Life You Want” Tour. iTunes named his podcast, The RobCast, Best of 2015. SARAH: In 1999, you started the Mars Hill Bible Church in a school gym and by 2011, the Sunday attendance numbered between 8,000 and 10,000 people, so this is huge. And then you decided to leave in 2011. Can you tell me why did you decide to leave at that point? ROB BELL: Because you have to keep going, you have to keep growing, you have to keep evolving. The whole thing is an adventure. When my wife Kristen and I first got married, we are about to celebrate 22 years married, we had this sense that life is an adventure and that you have this partner and you go on and you just keep learning and exploring and growing. So for us, it was never about some arbitrary measure of success or accumulation of possessions or something, it was always about the exploration, the hunt, the discovery, the joy of what’s around the corner. ROB BELL: So yeah, when we were 28, we started a church. It got massive right away. Within a year or two, it was 10,000 people, we took over a mall, it was just so surreal. We got to see incredible things happen and then it was like that season came to an end and it was time to keep going. And also as a spiritual teacher, my interest is in helping people be human and being fully alive. And I was never interested in building up one particular religion. To me, it was always about what does it mean to be human, what does it mean to be alive, how do you forgive people who have wronged you, how do you find your path, how do you use whatever you’ve been given or blessed with to help those who have been kicked around, who have been forgotten, who have been neglected. How do you wake up in the morning with a sense of wonder and awe about this day and what we get to do this day. ROB BELL: So yeah, we left Michigan and we moved to California. And I make books, and I have a one man show at Largo, which is a comedy club here in town. And I do tours, doing a tour right now based around this new book where we do like a pop-up living room, we get a dance hall or a club or art gallery and we do it in the… We put the chairs real close together, like a big living room. So I just keep making things and it’s just been so much fun, that’s what I do. ROB BELL: We all have more power to create our lives than we realize. And for many people, life is something that happens to them. And so they will tell you, “I’m stuck here on the couch because this happened and my parents didn’t do this and somebody broke my heart and I tried this and I failed,” but you actually have more power than you realize, and especially the things that came your way that you never wanted to come your way: Failure, bankruptcy, heartache, divorce, whatever it is, disease. How you respond to those hardships is actually a creative act, and what you do with the difficulty that comes your way, that’s all part of how you create your life. ROB BELL: My answer is joy, I actually think joy is the engine of the universe. And by joy, I don’t mean happy, which is like, “Hey, ‘look at this, this wine tastes good, look at my new car’ happy.” I mean joy as a substantive encounter of something bigger than you that you are in the flow of, that you’ve tapped into. And I say that because some of the people that I know who are the most joyful are the people I know who have suffered the most. And what happened to me as a pastor, when I was starting out… What’s interesting when you are a pastor is people invite you into their inner ring. So when you do a wedding, you may have met this couple two or three different times, but then you are the one standing up there with just the two of them in the ceremony. Do you know what I mean? ROB BELL: So you get ushered in when there’s a funeral, you’re at the funeral home with all of the closest relatives and you are the one who’s sort of steering the thing. Or when the number of times a couple had a young baby, who was maybe not gonna live and they had him in the ICU unit in this clear plastic box, they invite you to stand over the baby with them. And what I just kept learning was that joy… You have to grieve and you have to weep and if you don’t respond to some of the pain of life with anger and rage and shock and doubt, then you are probably not alive. But what I kept noticing is that joy had nothing to do with how much money people had, how successful they were, how big their house was. Do you know what I mean? ROB BELL: “Please send them to me.” And they had fostered like 26 kids, and they were like, “Yeah, we can’t imagine our life without these incredibly troubled needy kids. We can’t even begin to imagine a life without the life that we’ve had with them.” And I just kept discovering that joy is something deeper than even circumstances, it is your openness to a larger flow of life. And some call that spirit, God, divine being itself, whatever you wanna call that, and it’s probably at a young age, everything just… It was like the rules are different than everybody thinks they are. It’s like the game is rigged, you’ve been told these are the rules and those aren’t the rules, and I’m here to tell you that’s not true. ROB BELL: Well, one of the things I’ve observed is growth happens when you are willing to challenge the assumptions of your family, tribe, workplace, friends, college roommates, maybe even partner, that generally we exist and we move within tribes and webs of relationship and generally there’s a neighborhood, a workplace, a family, there is a center of gravity of consciousness. A set of assumptions, “This is how life works,” and generally you don’t move forward until you’re willing to challenge… Until you have become aware that you’ve been living according to rules that somebody somewhere made up that you don’t have to follow. ROB BELL: So like the number of people who realize, “Hey wait, I could live in a smaller house, and have less bills.” Or, “I could live closer to work and then I can walk and we can have one less car.” Or, “We could live really skinny for a couple of years and save every last penny and then we could leave and go travel for a while.” People do this all the time. And so often, people have a low level of despair, and despair is the spiritual disease of believing that tomorrow will simply be a repeat of today. And yet, especially in the modern world, more technology, more autonomy, more options than ever and yet, more people are living with despair, even wealthy educated successful people. At some level, sometimes they aren’t even aware of it, have bought into… Well like, “That’s never gonna change.” And it’s just not true, it’s just not true. SARAH: What is your advice for people who are unsure of their purpose, who are having trouble really pinpointing what it is that they’re here to do, and you believe that every single person has a specific purpose that they were put on the planet to do? ROB BELL: No, I wouldn’t make it that specific because if one of your children gets cancer, you suddenly may be caring for them and that’s what you’re doing. Or there’s a natural disaster and suddenly you’re in Haiti sorting through earthquake rubble, that’s what you’re doing now. So I think actually part of the problem is when people are like, “There’s this one thing I’m supposed to do, I’m supposed to get paid for, and so I’m supposed to do it for the rest of my life.” I know more people who have done 10 things. Do you know what I mean? ROB BELL: They did this for a while, then they did that and it may seem like very disconnected disparate things, but then you can often see a thread through all of it. So I think the first thing is simply to think about your life in seasons. And in our culture, we’re so cut off from the natural seasons of life, it’s hard to remember that for thousands of years people lived with a very acute awareness of the seasons; things die, things are planted, things spring forth, there’s a Summer harvest, then in the Winter… So there are seasons of life. In our culture if the sitcom is funny for five seasons, then they make seven seasons. ROB BELL: Just hang on, just hold on, just keep that job even though you probably should have left two years ago. And when you stay too long, then graduations become divorces. SARAH: Yes, I love that line. ROB BELL: How many people, when they look back, are like, “Oh my God, there was this window, I should have left and gone onto the next thing. But it was safe and it was comfortable, so I stayed.” And now I’m like, “I should have gone.” Or they leave and they do the next thing and they’re like, “This is so much better! I can’t believe I didn’t do this earlier.” So I always begin with… One way to begin would be what do you love? What is it that when you’ve been involved in whatever that is, something within you comes alive and you think, “I could do this forever.” So maybe you start with what you love. Other times, it’s anger. What is it that just makes you so cranked up, so righteously pissed off? Like, “Somebody should do something about that!” Well, maybe you’re the somebody. A lot of people who are doing really interesting things when you ask them why, they say, “‘Cause I saw a need that nobody was meeting and I was cranked up about it, so I went and did something about it.” And that’s really inspiring. ROB BELL: So I think it’s actually important to broaden the scope of what your purpose is. Otherwise, people get all bound up. You know what I mean? There’s this one thing, it’s almost like an Easter egg hunt. “There’s this one egg. It’s hidden somewhere and I gotta find it. If I don’t, I’m gonna be a wreck.” And widen it to, “It’s this big, beautiful, heart-breaking, screwed up, mysterious world and you have this energy, this divine energy you’ve been given to contribute. To help heal it and repair it and restore it. So what are you gonna do now?” And do it. And then at some point, maybe you’ll shift and do something else. To think of it much more in terms of… I always say that calling is overrated and curiosity is underrated. So what are you curious about? Let’s start there. SARAH: Yes, I was wondering how you pronounced that. I was hoping you would bring it up first. ROB BELL: Oh, how I pronounce all foreign words is I just fake it, I just make up my own pronunciation. But it’s interesting in Japanese culture, this word “ikigai” is that which gets you up in the morning. And the idea… It’s also sometimes translated “reason for being.” But the idea behind ikigai is that there is something that will get you out of bed in the morning, that will fill your life with a sense that your life is bigger than just your life. That you are here to serve, to give, that meaning is found not in isolation, but in relationship. Figuring out who you are and what you’re doing here, figuring out what you’ve been given that you can pass on to others. ROB BELL: So I just begin with you have been given resource, talent, energy, life, skill, passion and somebody somewhere needs what you have and life is about figuring out what it is that you have to give to those who need it. Now obviously, there are periods of life when you’re exhausted, burned out, tired, sick and you need just somebody to take care of you. But ultimately, our moments of greatest joy are generally, when you ask people, they tell about moments when they got to help somebody. They got to give out of their own abundance and somehow they felt like they were taking part in a larger flow and then that’s when we feel like everything is how it should be. And CRAFT says, “Can you believe I get to do this? SARAH: Okay. So lets talk about craft vs success. What is the difference between the two? 18:25 RB: Yeah. In the book, I sort of used success in a very over-the-top sense of when your joy is found in the thing that you’re gonna accomplish some day or when I get that thing achieved or that car, or when I get that person to notice me, then you’re here, but you’re also not here. Your joy is up ahead in the road. And the thing about success is if your joy… Man, when that happens, then I’ll be happy. Is then happy or joy is then always going to be a step ahead of you. And there is this sort of existential thud that can happen when you accomplish the thing you’ve been working so hard for and it doesn’t deliver what it was supposed to. And that craft in contrast, craft is the sense that you have work that you’re here to do and your learning and your growing. They’re the subtleties and the nuances of the craft and you come from a long line of people who do whatever this is. ROB BELL: Being a mom, running a business, being an insurance agent, whatever it is. And so you wake up each morning with this, “Alright. Today we’re gonna do the thing that we do. We’re gonna learn, we’re gonna grow.” You’re like a life-long student of it. And craft is different then success, ’cause success is like, “What more can I get?” And craft says, “Can you believe I get to do this?” There’s a humility with craft. Think about the great architects, the great painters, the great thinkers, the great writers, they were all people who when they’re interviewed, they don’t… I mean, thing about the great athletes who don’t go, “Yeah, I’m awesome.” They go, “Yeah, I’m learning, I’m growing, I’m making changes, I’m making tweaks.” But that’s actually where the joy is, is you’re working a trade here, you’re doing a craft, you got something, and you keep learning and you keep growing. I think we have many people in our culture, we have lost a sense of craft. It just becomes about a job. I get paid, I go to work, I do the work, I leave. But there’s an honor and a dignity to craft. You are a human being and you are here and you’re contributing and that’s a beautiful thing. And sometimes just that change of perspective can infuse your life with all kinds of new perspective. Take Risks.. nerves are good! They mean you’re alive! ROB BELL: Absolutely. And over time you realize better to be in the game, better to be in the game. That’s where it’s interesting and you just don’t… Most of the time, the pushback from other people is your action has exposed their inaction, your empowerment has revealed their disempowerment. If you’re all on the couch and one of you gets up off the couch and says, “I’m gonna do something with my life,” it’s terrifying if you’re still back there on the couch. Because how do you explain this person’s courage to go do something with their life? How do you explain it if you’re still paralyzed, catatonic, stuck on the couch? And that’s the thing that you realize is the pushback, especially from others, is often way more about them than it is about you. And then you also realize that the issue isn’t success and failure. Because lots of things you’ll try, it’ll be fine, it’ll be okay. Some things won’t work, some things will. That the larger issue is being alive. And some things bring you life, so you pursue them. And you don’t apologize for it and you don’t defend it. You just go after those things. Such a better way to live. ROB BELL: “The only question is what is the next right thing?” I think for many people, there’s this giant hairball of hope and ambition and dreams and goals. And as long as it’s just a big giant hairball floating above your head and heart, you can’t make progress. But generally, even if you have a prayer that’s as simple as, “Show me,” which I think is one of the more profound prayers you can utter or a meditation or a mantra. Show me. All you’re looking for is one step. That’s all you need. And that’s the step that moves you from disempowered to empowered. It moves you from night into day. It moves you from inaction to action. It’s just this one… Like show me one. Okay, a phone call. I will break it down into so simple, “Today, what am I gonna do? Oh, just make that phone call.” And then once you made the phone call, then ask the question again. What’s the next thing? ROB BELL: Every person that listens to you who wants to do big things… Okay, all of that will only happen if you start with something right in front of you that you can actually do. And you’ll be shocked when you do that thing, how many things then will kick in gear. And you’re wondering, like in the book, I talk about the first number is always a one, you’re like, “Yeah, but how will I do the rent? How will I pay this? How will I…? ” You know what? I don’t know. And a bunch of questions that you have. If you do the first step, you may be shocked to see how many of those questions change or go away or move themselves up in the queue. But that’s how it works. First number is always a one. SARAH: I love that. I think that makes it feel more manageable and just attainable. So you talk about the comparison game and kind of how that’s gonna be crippling, basically, so we need to stop comparing ourselves. How do we do that? Especially with social media, that’s only heightening this issue. So how do we stop comparing ourselves to others? ROB BELL: For some people, you probably need to be very careful about social media because a lot of it’s a lie. This person is giving you an incredibly curated, edited vision of who they are. SARAH: It’s their highlight reel. ROB BELL: Yeah, and you are judging what you do know about yourself with what you don’t know about them, and it’s just irrelevant. They have their struggles, you’ll have yours. They have their life, you have your life. You will just, what is that to you? It has nothing to do with what you’re here to do. So part of it is the discipline of there will always be somebody smarter, there will always be somebody with more energy, there will always be somebody who went to a better college, there will be always somebody who can do math faster. I mean it starts when you’re in junior high and it never lets up. So that’s just irrelevant to you being who you are. And part of it is just training yourself. This is why I practice a path. Rituals are so incredibly important. Prayers, mantras, meditations. 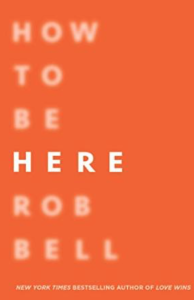 ROB BELL: You have your work to do in the world and you have to essentially surround yourself with reminders of who you are and what you’re here to do. Because otherwise, if you don’t proactively hang pictures on the wall, listen to certain music, whatever it is, hang messages to yourself on your bathroom mirror. If you don’t actively surround your life with tangible reminders of who you are and what you’re doing here, the world will surround you with reminders. And it will basically tell you, you are not whatever enough, smart, thin, short, smart, brilliant, wealthy enough, and you should get more products because then you’ll be happier and look at the great life other people are living. And it’s just not true. SARAH: Will you tell the story from the book about your head injury? ROB BELL: I hit my head, I was doing back flips on a wakeboarding, and really messed up my… I got a closed head injury and I had to be introduced to my kids, and I got a tour of my life. And I could see my life, because of the concussion, I could see my life from outside of my life. And so I was like, “Kristen, whats my job? Where did we meet?” And then they brought our boys into the room. And whatever was happening ’cause of my head injury, I didn’t have energy to think about the future which is where worry comes from, I didn’t have energy to think about the past which is where regret comes from, I could only be fully present. And the present moment was more than enough. ROB BELL: I got this tour of my life and it was unbelievable, it was riveting, it was the most exciting thing I’d ever seen. And I realized that this is what it means to be fully present, and that I live in a world and I live a life in which I’m all over the place all the time, like my brain is ping-ponging. So in many ways, this book, “How To Be Here,” is me sharing what I’ve learned over the past 15 years since I hit my head, of how to live in such a way that you don’t always feel like you’re missing it. And it’s just been incredible. I’ve learned so much and a lot of this book is what comes out of what I learned from the head injury, and deciding I wanted to live differently. SARAH: I love that. Here, I’m gonna read you my favorite quote from the book. ROB BELL: Oh, man. Let’s do that.